I first encountered Jun Tanaka’s food at Pearl in Holborn where he was executive chef until 2013, with more than 20 years experience working in London’s finest kitchens along side the best chefs such as, Marco Pierre White, Phillip Howard and the Roux brothers to name a few. This is his first Solo restaurant and the ninth place he has worked hence the name. Located in the heart of Fitzrovia the covered entrance has a small terrace that leads into a cosy bar area, the Manhattan styling uses warm terracotta and greens, dark wood floors with touches of copper and exposed brickwork make it and inviting space. The bar area is defined by stylish iron wine racks the rest of the space is flanked on one side by lather banquettes and reasonably spaced tables for two and four. 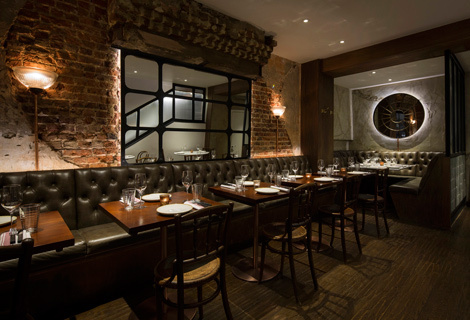 There is an upstairs area with more seating and bar that can also be used for private dining. I felt the upper floor was a bit more intimate and the lighting a little more moody than the brighter lit downstairs. 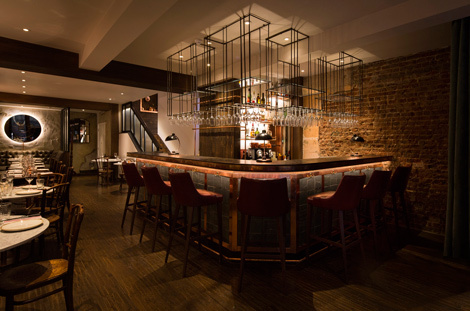 The small bar area flanked by terracotta leather bar stools is reserved for walk-ins or pre dinner drinks. We tried the house cocktail, the Ninth, specially created for the restaurant based on Hendricks Gin, apple juice and Elderflower. It was light, tangy and refreshing. It was a pleasure to see a simple, uncomplicated menu, neatly laid out without an overwhelming amount of options, likewise with the wine list, comprehensive and compact. The menu is divided into, snacks, starters, salads, raw and cured, meat, fish, vegetables and dessert, and is designed for sharing. To say the food is simple could be misleading – it is elegant, unfussy, and thoughtfully put together using the best seasonal ingredients. Starting with a little snack, we had the delicious oxtail croquettes, deeply meaty and savoury enjoyed with a glass of Rioja. Our starters followed and we shared two plates of perfection, an Ossobuco tortellini with bone marrow, the pasta still a little al dente and delightfully chewy, and Rabbit confit Lasagne, layers of rich flavour topped with a creamy mustard sauce, both eaten with relish and not a morsel left. 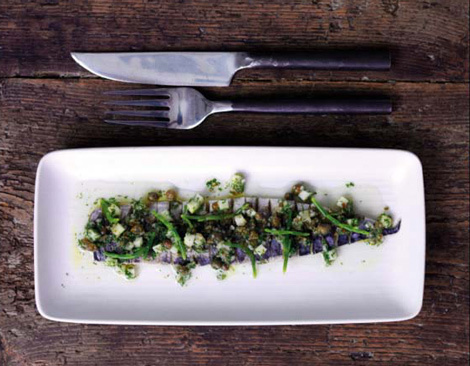 The flavours are deep and uncluttered; this is simplicity at its best. For good measure we also sampled the flamed mackerel, with dill, cucumbers and capers, super fresh fish, mildly pickled and smoky, it worked a treat. Our mains arrived and we realised we may have over ordered, or need a bigger table, as the portions are generous and perfect to share. Whole roast sea beam with lemon and miso smoked Aubergine came with charred crispy skin and soft succulent interior alongside, pommes cocotte with roasted garlic, these are potatoes to die for, soft caramelised and buttery, glazed salsify with parsley breadcrumbs, a veg you rarely see on a menu and much underrated, and beetroot tart tatin topped with feta and pine nuts we had food a plenty. We chose a carafe of Reisling which went beautifully with the food, good to see a selection of wines available by the glass or carafe. Finally, we somehow found space for dessert, choosing a vanilla yogurt and poached rhubarb, which sounds plain but was layers of tangy yogurt, chunky rhubarb compot and a light as air rhubarb mousse topped with a crunchy crumble. We also had Brillat Savarin cheesecake with blood orange sorbet, silky smooth cheesecake and a buttery crunchy base, perfect along with the tangy orange sorbet, for me I would have preferred the sorbet a little sharper, but really a minor point. 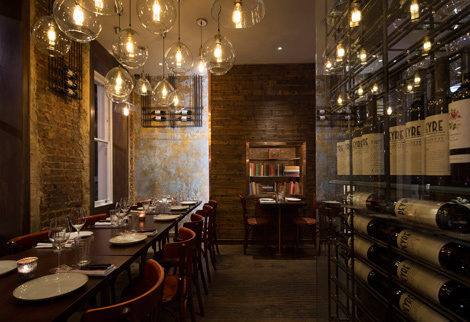 The well-briefed staff were friendly, knowledgeable and gave good advice on both the menu and the wine. The staff were attentive without being intrusive, there were no long waits and we were not made to feel hurried or rushed. Smart, professional and welcoming. Jun Tanaka has delivered a simple but elegant menu of top class seasonal food, each ingredient heroed to great effect. This is modern Mediterranean food with his own special twist. So refreshing to see great vegetable dishes that are not just treated as a garnish but worthy dishes in their own right. Go soon as it wont be long before it will be impossible to get a table.